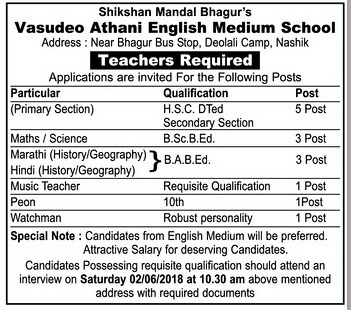 Vasudeo Athani English Medium School, Nashik has advertised in THE Lokmat newspaper for recruitment of Teachers jobs vacancies. Interested and eligible job aspirants are requested to attend interview on 2nd June 2018 .Check out further more details below. About School:VASUDEO ATHANI ENGLISH SCH DEOLALI CAMP was established in 2005 and it is managed by the Private Unaided Management. It is located in urban area . It is located in NASHIK block of NASHIK district of MAHARASHTRA. The school consists of Grades from 1 to 8. The school is co-educational and it does not have an attached pre-primary section. The school is non-residential in nature and is not using school building as a shift-school. During the previous academic year; the school functioned for 229 days. It had 2 academic inspections and was not visited by the CRC and BRC Coordinators during the previous academic year. Â English is the medium of instructions in this school. This school is approachable by all weather road. In this school academic session starts in June. How to Apply: Interested and eligible candidates may attend interview will be conducted on 2nd June 2018 timing 10.30am.